It’s not often when I find a drama that keeps my attention from start to finish. School 2015 manages to tell a story with so much mystery that the viewer can’t help but keep holding on for the entire ride. Kind-hearted Lee Eun Bi and confident Go Eun Byul are twin sisters living two very different lives. Eun Bi lives in an orphanage in the town of Tongyang, where she is tormented on a regular basis by bullies. On the other hand, Eun Byul who was adopted year earlier is living her life comfortably with her mother in Seoul. One day Eun Byul goes missing during a school trip. After a suicide attempt, Eun Bi loses her memory and is mistaken for Eun Byul in the hospital. As Eun Bi slowly regains her memories,she realizes she is not Eun Byul and she begins to discover that there is more to the story behind her missing sister and she has just been pulled into the middle of it. The primary reason why I picked up this drama was because I had quite enjoyed School 2013 with Lee Jong Suk and Kim Woo Bin (I mean, who the hell didn’t). I’ve had good experiences watching dramas that are part of a channel series, so I was pretty open-minded. I was also excited to see Kim So Hyun, my favorite child actress, in a non-child counterpart role, as I’ve enjoyed many of her previous works. In the entertainment department, this drama gets a 10/10 from me. Although it was a tad bit confusing to follow the immediate shifts from one twin’s life to the other in the first episode, I was immediately hooked, and hardly perturbed by it. On top of that, I think this drama had some of the best cliff-hangers. I used to make such a fuss about watching airing drama (I’m so impatient), and watching School 2015 reminded me of why I followed that rule. Despite that, each week I was so excited for my next episode to finish subbing, and I’d keep revisiting the website over-and-over. Luckily the site I use has super fast subbing. Because it is part of the School series, I do have to mention something that I was a little disappointed about. In School 2013, the writers did a great job focusing on the students as a class. It was always evident who the main character was, but there were other key students that got a respectable story line. Not everything was about Go Nam Soon, and some of those other students that were also a big part of the drama didn’t really interact with him. There were even administrative issues that didn’t involve him. It was a ‘school’ drama about students, and real issues that they might face. Dramatic, but also realistic as well. On the other hand, School 2015 didn’t really lose focus from Lee Eun Bi. She was the main character and any issue in this drama involved her in some way or another. Instead of it being a ‘School’ drama, it was really just a typical teen romance drama with a mystery theme to it in a school setting. Of course that’s not a bad thing, the drama was pretty interesting, but since it was supposed to be part of the series, I feel like the writers could have done a better job of distributing some of the screen time and attention to other students and their problems. If it were me, I would have tried to focus a little on the characters instead of it always being about Eun Bi or the love story. I think this drama was well told, but I don’t think it would have made it less interesting if there was a little more emphasis on the children themselves. Back to the actual drama itself: School 2015 is super easy to watch! I started with a handful of episodes (because I didn’t pick it up until a few weeks of airing), and before I knew it, I was done and starving for more! I’m going to miss this one, I already do. It’s finally time to talk about how wonderful Kim So Hyun’s acting is, and what a little lady she has become. The first time I ever saw a drama with her in it was King of Baking as one of the sisters’ child-counterpart. She didn’t get a whole lot of screen time at the time, so I didn’t pay much attention to her. It wasn’t until her role as the child-counterpart of the spiteful Bo Kyung in The Moon That Embraces the Sun, that I truly began to admire her superb acting skills. I’ve seen her play a few different roles in various genres. This is going to sound weird, but I like her best when her character is miserable. Truthfully, I’ve only seen her play one happy-go-lucky character in Ma Boy, but her good acting skills are too advanced for such average characters. In School 2015, KSH was given the challenge of having to play dual roles. I don’t think just anyone would be able to pull this off as well as the young Kim So Hyun did. I’m not too harsh on criticizing actors when they do play two different characters because, come on, it’s a K-Drama. As long as the acting isn’t completely mediocre, I think most of us are willing to turn a blind eye. Usually all the directors have to do is part the actor’s hair to the opposite side and have them speak in a lower tone, and we’ll accept it. For her roles as Eun Bi/Eun Byul, however, Kim So Hyun was able to prove that acting is more than just ‘pretending’. KSH was truly two different people! As Eun Bi, there was an innocent, fragile, even frustrating weakness that came along with the role. But when she was playing Eun Byul, the confidence and even manner of carrying herself was different. When Eun Byul was pissed off, there was almost a fire in her eyes that even an upset Eun Bi didn’t have. She was able to bring out different sides to both characters wonderfully. Another actress in this drama that just blew me away was Jo Soo Hyang who played Kang So Yeong. Gawd I hated that character. I just wanted to jump into the scene and slap the mess out of her, even when all she was just doing was standing in the background. As soon as I was done watching the first two episodes, I made it my mission to find out this actress’ name. It was so shocking to me that this was her first drama role!! I really hope she is given another script soon, I thoroughly enjoyed hating this girl (as So Yeong) and I would like to see more of her. School 2015 would definitely not have been the same without her. 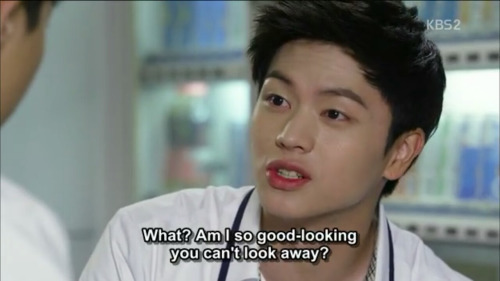 Now that School 2015 is over, I think I’m going through Sungjae withdraw syndrome. I just finished the drama earlier today and I already miss him. I know-you know that feeling where you just keep thinking about a certain actor and there’s just an empty hole in your heart. That’s how I feel right now. I’m familiar with Sungjae because he is the maknae of one of my most beloved K-Pop groups, BTOB. To say that I’m happily surprised with how well he played his character is an understatement. Not only is he a fantastic vocalist, but the boy can act!! 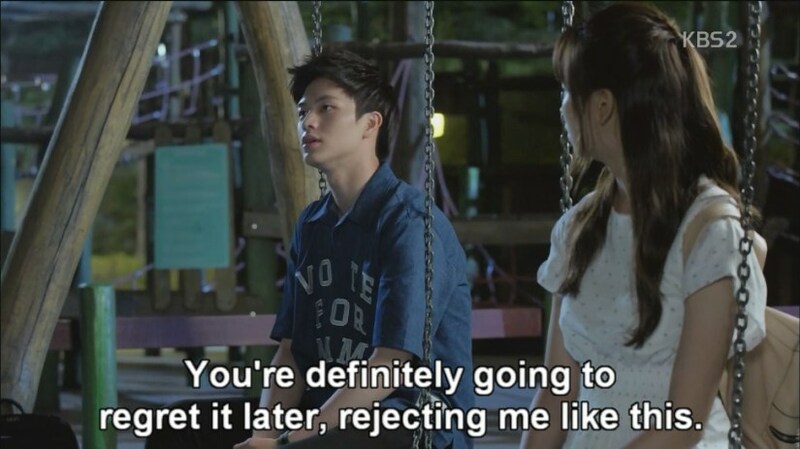 I know I gushed over Kim So Hyun’s acting earlier, but it really was Sungjae’s portrayal of Gong Tae Kwang who was the superstar in this series. I just about melted for him!! And I love how honest he was! If a guy likes a girl, hiding it is so sissy! Tae Kwang wasn’t afraid to love Eun Bi, and he made sure she knew it. He didn’t force his feelings onto her, but he also didn’t just sit back and do nothing about it. I am a strong believer in the whole ‘rather regret something you did than something you didn’t do’ thing. Without a doubt, the weakest of all the characters had to be Han Yi Ahn who was played by YG K-Plus’ Nam Joo Hyuk (whom you may have remembered from Akdong Musician’s “100%” and “Give Love” MV’s that give me all sorts of happy feels just thinking about). I’m not sure if it was either the approach that NJH took on his role or it was that the character himself was poorly designed, but I really didn’t feel much for Han Yi Ahn. To put it bluntly, his character was straight up boring and totally unnecessary. I didn’t dislike the guy, but he just never seemed to make me feel like he deserved to be the lead. He had absolutely no character development(to be fair, no one really did, but this guy especially) and his relevance to the story was just riding on everyone else’s coattail. I’m still trying to figure out what it was that Lee Eun Bi even saw in this guy, he had second-lead written all over him. It was like watching someone pick the WRONG person. However, it was definitely due to poor writing that Han Yi Ahn ended up with a supporting actor feel. It was almost as if the writers didn’t know what to do with this character after they realized all the really important features that are fit for a first lead were given to Tae Kwang. Now do you remember him? I don’t usually make a segment to talk about the love triangle, but I’d like to address something. I mean what was that? This drama is the biggest injustice in the history of love stories I’ve ever watched! You know how we are always complaining about the nice guy never gets the girl and all that. Well, I just watched the ‘supposed’ nice guy get the girl without ever even trying, and I hated it! Actually, Tae Kwang may not have been a sweet-talker, but if you add up all the things he did for Eun Bi: sticking up for her, protecting her secret, visiting her all the way to Tongyang, comforting her, taking her out when she needed a breather, looking out for her and encouraging her, I think Tae Kwang was the obvious answer. All Han Yi Ahn did was give her a golden medal (that was actually supposed to be for Eun Byul), and ran to her ONCE (but so did Tae Kwang, I get madder the more I think about it). Ah, I just remembered how fickle Han Yi Ahn is, too. 10 years of loving Eun Byul. And what, just a little tear and that’s it? All of a sudden he is full-on in love with Eun Bi? Girl, he ain’t loyal. I’m trying to figure out the logic behind the OTP but nothing comes to mind. She said that she wanted someone that loved her for her. Then what was Tae Kwang and all he did for her? I got to the point where I was like “whatever”, I don’t care how blind Eun Bi is, at least Tae Kwang got all the screen time. The music used for this drama was pretty descent. Hands down, the best song was definitely TJ Tiger’s – Reset (feat. Jinshil of Mad Soul Child). You can listen and download it right HERE. School 2013 – Only because it’s the prequel and it’s really great, but it doesn’t have any similarities to School 2015. Missing You – Bullies, murder and mysterious pasts. Also, Kim So Hyun is in both of them. 4th Period Mystery – Murder mystery in a high school setting.